This way it’s easy for each viewer of your dashboards to cut through the clutter and get to the data they need. 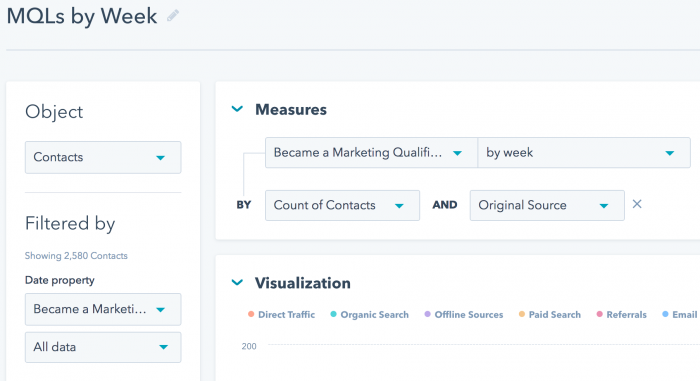 Most of your dashboards are automatically generated by the marketing stack. However, expect that some metrics may need to be manually compiled or calculated. This is a great task for your intern to run weekly prior to the team meeting. As pretty as you make your dashboards, it’s always challenging to get stakeholders to log into a software tool to look at them. Therefore, recurring weekly emails are ideal. Most tools (like Hubspot and Salesforce) make it easy to generate an auto email to specific stakeholders with specific dashboards each week. I have that email run the night before the team meeting so everyone has a chance to review the metrics and use them to guide the discussion. In some cases, a dashboard might have some metrics that live in marketing automation and some that live in CRM, but both should be grouped in the same dashboard. In many cases, the integration between your systems can bridge that gap and pull in the metrics needed from CRM to marketing automation. Otherwise, this is a good example of the need to compile some metrics manually. While visualizations are certainly an important aspect of dashboards, do not overlook the power of a tabular report with summaries at the bottom. When I’m looking at sales metrics (e.g. funnel by rep or MQL conversions), I actually prefer to get to the granular details in a table because it is easier for me to understand the numbers. Lastly, strive to keep dashboards simple. Many marketing automation systems have out of the box templates that cover 80% of the metrics you want to track. Custom build the rest, and as always, avoid reinventing the wheel.